Semilla snack bags giveaway winner! Here's the deal. A while back I bought a voucher for Semilla Snack Bags from the deal-of-the-day site, Jasmere. The voucher is a $40 store credit (I bought it for $12 or $13). 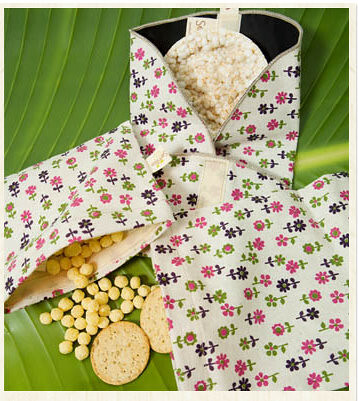 Semilla makes reusable snack bags, sandwich wraps, lunch bags. They look lovely (I don't have any, but I am drawn to them!) and are made here in the US, in San Diego! While I love the products (the retro View-Master fabric is totally rad! ), I just don't NEED any more lunch bags. I'm drowning in them as it is... I keep filling my cart at Semilla and then feeling guilty for purchasing something I don't need. Ack! So I'm going to give away my $40 store credit. :) The catch is this: I bought it awhile ago, and it is going to expire May 28. So this giveaway is only going to run until tomorrow night (Thursday, May 26) so the winner has a chance to get the order in in time! The voucher is good for anything in the store EXCEPT for the stainless round. However if you want the snack kit that includes the stainless round, that's cool. You just can't use the voucher for the stainless round on its own. The voucher expires May 28, so the winner will need to shop quickly!